After reporting that its next quarter was going to fall short of expectations, Target Corporation (NYSE:TGT) was absolutely crushed by the market, with the stock almost flat since the announcement. Wait — flat? Can that be right? Hold on, let me check — OK, yes, it’s flat. 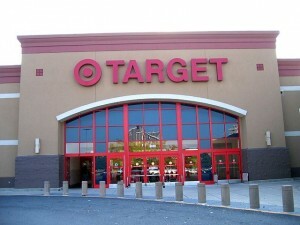 So what is it about Target Corporation (NYSE:TGT) that makes investors so happy? The stock is up 20% over the last 12 months, and even holiday setbacks don’t seem to have had much impact on investors’ confidence. But it’s not just Target. Wal-Mart Stores, Inc. (NYSE:WMT) and Costco Wholesale Corporation (NASDAQ:COST) are also Freddie Mercury-style rocketships these days. The combination of brand strength and diverse product selection has made them seemingly safe bets. Tack on a healthy — or at least existent — dividend, and you’ve got yourself a winner. A snapshot of the companies’ growth over the past 12 months shows you just how good these investments have been. All three chains have beat out the S&P handily. Part of the reason that Target Corporation (NYSE:TGT) hasn’t moved much since its announcement is that the adjusted earnings estimate — at the low end of the $1.10-to-$1.20-per-share range — is still higher than the $1.05 that analysts are looking for. The company has been optimistic and successful recently, surprising everyone last quarter when it reported adjusted earnings per share of $1.65, while Wall Street was only expecting $1.47. Strong earnings have come through despite downturns in gas prices and weak exchange rates. Costco Wholesale Corporation (NASDAQ:COST)’s comparable March sales were up 4% including the headwinds, and up 6% excluding their effects. That’s an excellent result for a huge business, and shows that consumers are still doing much of their shopping based on price. While it’s been a good 12 months, there are still some spots that all these companies need to work out. As Target’s last announcement highlighted, seasonal trends can have a huge impact on earnings. The company surprised last quarter in part because it was able to overcome a weak holiday season, even with a failed joint venture involving Neiman Marcus. 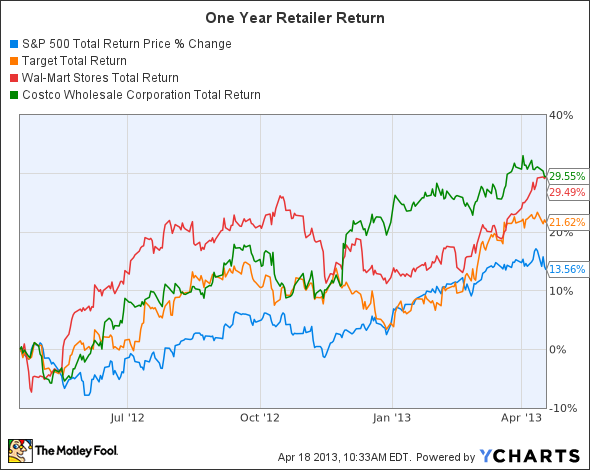 Wal-Mart Stores, Inc. (NYSE:WMT) has been less lucky in its dealings. Recent reports have said that the company is suffering from falling sales and understocked shelves. Given the uninspiring news, I lean toward Costco Wholesale Corporation (NASDAQ:COST) as a long-term holding. The company has connected with its customer base in strong and inventive ways, and I expect it to continue to move from strength to strength in the coming years. The article Even After Bad News, These Retailers Still Shine originally appeared on Fool.com. Fool contributor Andrew Marder has no position in any stocks mentioned. The Motley Fool recommends Costco Wholesale Corporation (NASDAQ:COST). The Motley Fool owns shares of Costco Wholesale.